We provide driveway cleaning, patio cleaning & sealing, mono block cleaning, re-sanding & sealing throughout and beyond Fife; as well as professional pressure washing services for high pressure cleaning of driveways, patios, mono block & all hard surfaces. Call Fife Window Cleaning now on 07856 539 498 or email using our online contact form for a FREE no obligation quote forpatio and driveway cleaning. See our separate patio cleaning page for information on these services. 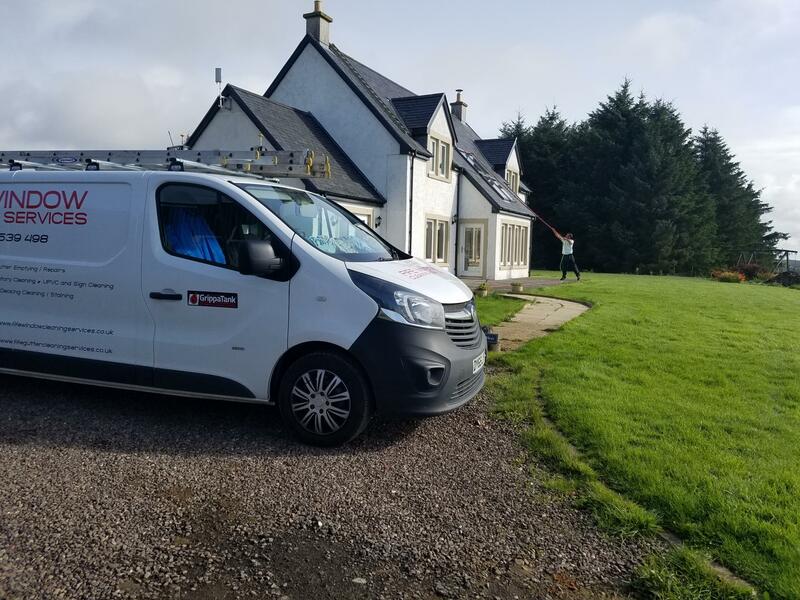 Our comprehensive range of exterior cleaning services are available throughout and beyond the central Scottish belt, and include professional and affordable jet washing and pressure cleaning services for all external hard surfaces. We are able to clean, seal and restore driveways and patios in all building materials including mono blocks, Indian Sandstone, limestone, pattern imprinted concrete, slabs, tarmac, concrete, paths and decking. Our professional undertaken driveway cleaning and patio cleaning services allows us to remove all dirt, algae, moss, lichens and other biological growths with ease. We can also treat surfaces with a highly effective biocidal wash that kills all spores and prevents their return for 12 months with long-lasting residual protection. Over time mono blocks lose their jointing sand and it’s replaced by dirt and weeds which seriously affects the appearance and strength of your driveway. Jointing sand is an integral part of the design and construction of mono blocks as it enhances the friction between the blocks. This is essential as it means the weight of vehicles is then spread over the entire surface. Without the sand, traffic weight is concentrated onto individual blocks which they are not designed to withstand. They then become loose or break and this has a knock-on effect across the surface. After pressure cleaning your mono blocks we refill the joints with kiln dried sand to ensure the on-going strength and effectiveness of your drive. The sand is then stabilised – or hardened – with a coat of high quality Resiblock Trade sealant which ensures the sand is held in place and not removed by rain and wind erosion. This sealer dries clear and does not affect the appearance of your mono blocks. With a combination of the best equipment, cleaning products and know-how our pressure washing services are usually able to remove stains such as oil, paint, chewing gum, food, drink and BBQ fats. Although no honest contractor can ever give absolute guarantees we can usually remove oil stains from paving and at the very least reduce their impact. Much depends on the age and severity of the oil stain, how ingrained and deeply penetrated it is, whether it was clean oil from a bottle or dirty oil from an engine and even the quality of the oil has a bearing on removal. We use www.resiblock.com as our sealant supplier, this is due to their reputation and also the fact they offer a variety of sealants for different surfaces. In addition to our pressure washing service we offer a full range of external cleaning services including conservatory cleaning , gutter cleaning and facias, soffits and cladding cleaning available in Dunfermline, Kirkcaldy, Glenrothes, Cowdenbeath and the whole Fife area. If you require further information or want to arrange a free quote please call on 07856 539 498 or email us using our online contact form.